"Sparse texturals are mixed with environmental sounds to generate a spectral realm existing in tandem with the known world. The atmospherics are extremely minimal in substance, creating a rarefied foundation that is then embellished by auxiliary sounds, most of which are equally slight in definition. This results in an auralscape of delicate mettle, one highly conducive to meditation. More substantial elements are used to enhance this dreamlike territory. Softly growling electronics sift through the drifting ambience, lending fragile augmentation to the overall calm. These compositions are deliberately sparse. 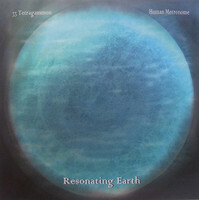 The meticulously arranged layers of vaporous sound generate a series of harmonic flows designed to sedate the listener and sequester them from cultural distractions, thereby attenuating consciousness to its place in the celestial order."